Is Learna only about computer-based learning? What does the Learna curriculum teach? The key to the success of our Learna method is that it identifies and automatically adapts to the strengths or weaknesses of your child in learning various concepts. In order to progress through a concept level in the curriculum, a child must achieve a certain minimum standard (in terms of speed and accuracy) in each activity corresponding to that concept. The time spent on each activity will vary for different children depending on their prior knowledge of related concepts and their capability for learning new material. The software changes the difficulty of the questions and/or the time for each question depending on the performance of the student. In addition, the software pushes the performance limits of children and enables them to achieve their best through adaptive challenging. When the software identifies gaps in a child’s prior knowledge, it switches to remedial or modified activities in a transparent manner without hurting the child’s self-confidence or self-esteem. 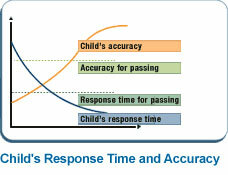 The software progresses in a regressive manner until all gaps in a child’s prior knowledge are filled. When the child performs significantly better than the requirement for passing a concept level, the software switches to enrichment mode to challenge the child and enhance his or her knowledge through advanced activities. The Learna software is designed to accommodate students of all levels –we want to ensure that no child is left behind. At Learna, our monitoring system is twofold. We monitor each child’s progress on an individual basis, but we also evaluate each of them according to what other students at that learning level are achieving. Our software logs all student responses and response times and uses the historical data about the performance of a child in previous related levels for adaptation. While your child is engaged in learning, the software provides instantaneous feedback to enable corrective learning. We track your child’s progress continuously and let you know where your child stands in the learning process. This not only reassures you-it builds your child’s confidence as well. The Learna software facilitates reinforced learning through individualised homework assignments. We don’t just follow the curriculum… we take into consideration your child’s abilities and skill level.